North winds 10-20 MPH with gusts up to 30-35 MPH. Northeast winds 10-15 MPH this morning turning north in the afternoon to 20-25 MPH - Gusts up to 40 MPH. Snow accumulation 4-8 inches near Castle Rock going east towards Limon 2-5 inches. Limon - North winds 20-25 MPH gusts up to 40 MPH. Snow accumulation 8-16 inches from Ft. Collins going west. 6-12 inches going west on the I-70 Corridor. North - northeast winds 5-15 MPH with gusts up to 25 MPH. This is Colorado Severe Weather Awareness Week a time when the National Weather Service reminds you of the hazards associated with thunderstorms. The topic for today is tornadoes and tornado safety. Tornadoes have been reported in just about all areas of the state, but historically 95 percent of Colorado tornadoes occur along and east of Interstate 25 where heat and moisture in the lower atmosphere are often more abundant. Tornadoes have occurred at every hour of the day, but most occur between 1 p.m. and 8 p.m.
Across the country about 90 percent of tornadoes are considered weak with winds under 110 m.p.h. Winds of this magnitude will damage a wood frame construction home but may completely destroy a mobile home or outbuilding. They typically have a life span of 5 or 10 minutes and result in less than 5 percent of tornado fatalities. Violent tornadoes account for only 1 percent of all tornadoes, but they result in nearly 70 percent of all tornado fatalities because they destroy much of what is in their path. Violent tornadoes can last over an hour and travel over 50 miles before dissipating. The only chance of surviving a violent tornado is to be inside a safe room or underground shelter. An easy phrase to remember for tornado safety is to get in, get down, and cover up. Get inside a sturdy building, get down to the lowest floor or most interior room in that building, and cover your head. Abandon modular homes and mobile homes as they offer little protection from tornadoes. If a tornado approaches leave these locations and seek safety in a nearby sturdier building or storm shelter. If you are driving in open country and see a tornado simply drive away from the tornado path if time permits. Do not take shelter beneath a highway overpass. If you are in an automobile and a tornado is fast approaching with little time for action...either pull over and remain buckled in your vehicle while crouching down or abandon your vehicle and lie in a ditch or culvert away from your vehicle and protect your head. If you are caught outside and cannot find a safe shelter crawl into a culvert or lie down in a narrow ditch and cover your head. But remember that the worst place to be when a tornado threatens is outside in the midst of flying debris. Remember you can get the latest weather forecasts and severe weather watches and warnings from a local NOAA Weather Radio All Hazards station. Severe weather information is also available on the internet from the Grand Junction National Weather Service office at www.weather.gov/gjt. It is Colorado Severe Weather Awareness Week. The Colorado Division of Homeland Security and Emergency Management is partnering with the National Weather Service Forecast Offices in Colorado to bring you daily briefs on preparing and understanding the severe weather in the state. Today we focus on watches and warnings. The NWS is providing a new blog each day. The National Weather Service sees the potential for severe weather and a stream of weather information flows from our forecast offices to you. Each National Weather Service forecast office has a web site, a Facebook page, and a Twitter feed where you can find weather stories. These are graphical looks at upcoming weather hazards. The Hazardous Weather Outlook is a text product and it is also available. It highlights weather hazards -sometimes seven days in advance. If severe weather becomes likely within six hours a watch will be issued to alert you of the higher chance for severe weather in or close to the watch area. If you are in or close to the watch area plan where you would go for shelter if severe weather was to occur. If high wind is a threat tying down or bringing loose objects indoors is a good idea. If large hail is a threat protecting your vehicle is a good idea. Then forecasters at the local National Weather Service office will monitor satellite and radar data and talk with severe weather spotters. Forecasters will issue warnings and quickly send them out to alert you of the imminent severe weather threat. The warnings are sent out in many different ways in order to reach the most people possible. A warning is an urgent message telling you that severe weather or flooding is imminent or is occurring. Warnings are usually issued for an area smaller than a county. A Severe Thunderstorm Warning is issued for wind gusts of 58 mph or higher or for hail one inch in diameter or greater. A Tornado Warning is issued when tornadoes are imminent or occurring. A Flash Flood Warning is issued for rapidly developing life threatening flooding. Before and during severe weather you can receive watches, warnings, and advisories on NOAA Weather Radio All Hazards. (http://www.nws.noaa.gov/nwr/) It is recommended that you buy a weather radio receiver with a built-in tone alarm which is activated by the National Weather Service when watches and warnings are issued. You can also find warnings on the internet or receive them from your local radio or television stations. Do not be caught off guard. Know how to receive watch and warning information...and know what to do when severe weather threatens. Specific safety information will be available each day of this Colorado Severe Weather Awareness Week. The Homeland Security and All-Hazards Senior Advisory Committee will be held on Monday, April 15, 2013. The April 15 Agenda is available to view. View the proposed Resource Mobilization Annex. The comment period closes on April 15. All comments should be sent to Bill Miederhoff at william.miederhoff@state.co.us. One of these structures is confirmed as a destroyed mobile home. One occupant has been displaced, but is not injured. A second residence was partially damaged. The Washington County Emergency Manager is working to confirm the extent of damage to the other structure. It is unknown if it is a home or another type of structure at this point. One non-residential structure was damaged. Half of the town of Akron is without power due to six power poles down between Brush and Last Chance. Weather spotters are still chasing storms in north-east Akron where they are reporting possible tornado activity. The cause of the damage has not been confirmed as a result of tornadoes. This confirmation may be available tomorrow from the National Weather Service. Washington County officials continue their rapid needs assessment. The Colorado Office of Emergency Management has a Regional Field Manager monitoring and supporting Washington County. 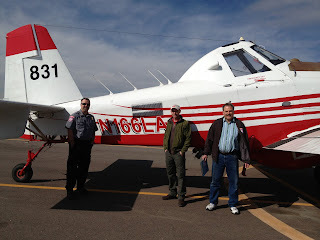 This is a short video of the Exclusive Use Single Engine Air Tanker (SEAT) under contract with the Colorado Division of Fire Prevention and Control. The division hosted a demonstration for agency partners and media this afternoon at the Ft. Collins/Loveland Airport where the SEAT is currently based.